Successfully Added USB Multi-Adapter (iPhone, PSP, Nintendo DS, Cellphones + More) to your Shopping Cart. Convenient USB multi-adapter for connecting your electronic devices to your computer for charging or file transfers. This USB multi-adapter comes with cellphone adapter tips for iPhone (2G, 3G, 3GS), HTC, Blackberry, Palm, Samsung, LG, Nokia, Sony Ericsson, and Motorola. 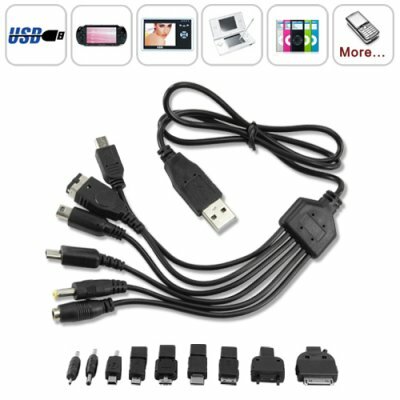 This kit also includes adapter tips for your iTouch, iPod, Nintendo DS, DSi and DS Lite, Sony PSP, Gameboy Advanced SP (GBA) and more. Whether you’re looking for a replacement power or data cable, or simply want a backup cable in case you loose or damage the original, this USB multi-adapter is the perfect solution to ensure you’ll always have the right cables for your favorite electronic devices. This USB Multi-Adapter set is being offered at an incredibly low wholesale price. Just look online and you’ll notice how stores charge more than $5 for just a single adapter tip! If you’re in the resale market then you should definitely place your bulk orders now while supplies last and we will express ship your order by tomorrow. Works just like the real cable you would get from you local retail stores - but this one comes with a low factory-direct China Wholesale Price!